The Julabo F38-ME refrigerating and heating circulator, now available from John Morris Scientific , is used within the beverage industry to simulate the beer and wine aging process to determine the durability and transport conditions of bottled beer. 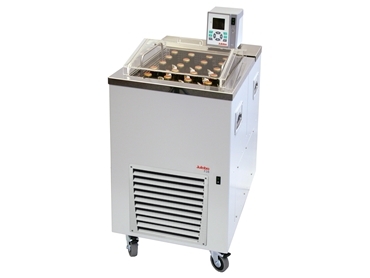 Designed for testing in a range from -38 to +80°C, the F38-ME refrigerating and heating ciruclator features a range of pre-programmed test ramps for forcing tests to enable convenient operation. Custom test cycles can also easily be programmed to suit current parameters. The beer bottles are exposed to heating and cooling cycles until the interpolated photometer has assessed turbidity. The F38-ME refrigerating and heating circulator has a stainless steel insert basket which can hold up to 20 standard beer bottles and castors for easy transport. A removable plexiglass cover protects users and provides optimal temperature control.